Compounded Drugs Mix Benefits With Possible Risk In the past few years, a battle has raged over how to regulate the 3,500 U.S. pharmacies that mix medications to individual specifications on site. Many patients say compounded drugs are their only option. But the FDA has safety concerns. 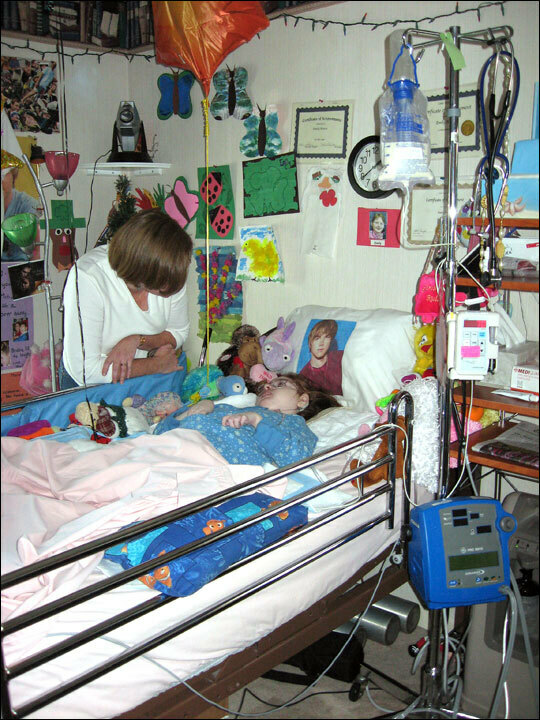 Emily Rivers is bedridden from complications associated with mitochondrial disease. Her mother Kathy, seen here, says she relies on compounded drugs to keep her daughter as healthy as possible. Kathy Rivers and her three children have a metabolic genetic disorder that requires they take dozens of medications each day to stay healthy. 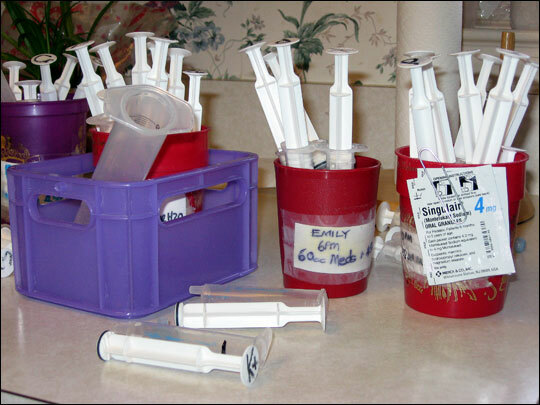 Some of 16-year-old Emily's medications are seen here. Sharon Louis picks up a compounded percription for her grandaughter at Village Green Apothecary in Bethesda, Md. She says 6-year-old Katherine has a rare liver disease and needs the mixture to help digest her food. Village Green senior pharmacist Ron Keach says many of his customers' lives would be significantly worse without compounded drugs. In the past few years, a battle has been raging over how to regulate the 3,500 compounding pharmacies across the United States. But the Food and Drug Administration is concerned about the safety of compounded drugs. At Village Green Apothecary in Bethesda, Md., people squeeze into a tiny space by the door, waiting to pick up their prescriptions. 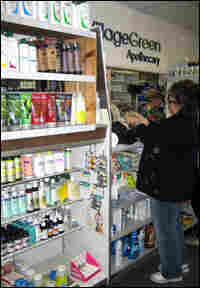 Sharon Louis comes to this pharmacy every month to pick up a compounded prescription for her granddaughter, Katherine. "This is the only place she can get it. It's a special compound. She's 6 years old now, but she was born with a liver disease," Louis says. Part of Katherine's liver was missing when she was born. The special medicine helps digest food, but she can't get it at your average pharmacy. Some drug stores can mix simple compounds now and then — but not more complicated medicines, like this one. Village Green is one of a few thousand pharmacies across the U.S. known for specializing in uncommon mixtures. 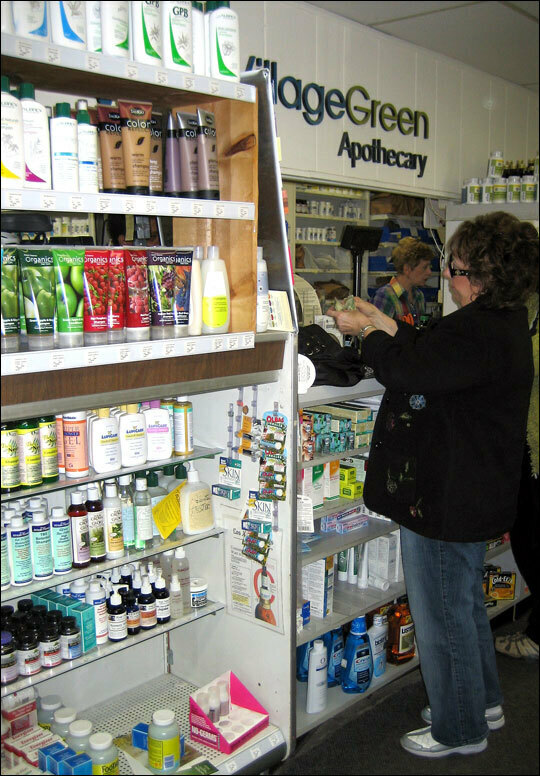 "It would be a problem if we didn't have an apothecary," Louis says. "It's very difficult to get this prescription other than [through] an apothecary that will do this mixture." 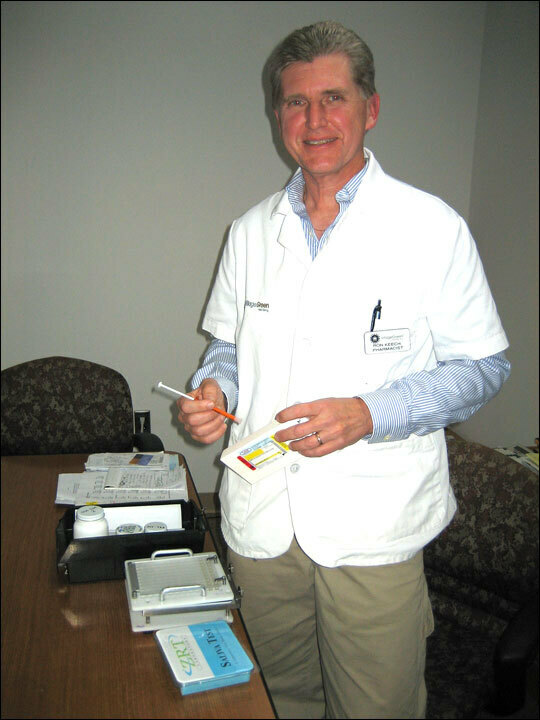 Ron Keach, Village Green's senior pharmacist, says half of the pharmacy's sales come from compounding medications. Keach and his team of pharmacists create drugs for people who can't tolerate dyes or additives. They also mix them in different forms for patients whose bodies won't absorb them the traditional way — or for people who need experimental drugs. And they can combine many pills into one. Kathy Rivers says that's why she gets prescriptions at Village Green. "If we took all the different B vitamins and all the different antioxidants and the carniteen and createen and CoQ10 — and took them all as individual pills — we would be taking probably 100 pills a day," she says of her family's situation. Taking that much medicine every day would be impossible for Rivers' 16-year-old daughter, Emily. She is bedridden from complications related to a metabolic genetic disorder — her body cannot turn food into energy to run cells and organs. Rivers and her three children all have mitochondrial disease. Due to the disease, her younger son can only eat a handful of foods – he has asthma and allergies. And Rivers spent hours upon hours researching options for herself and her children. "I stay at home with my kids now, and that has made it easier for me to look all this up. ... It's challenging, but you'd be surprised what parents will do for their kids," she says. Rivers eventually found some help. Dr. Richard Layton is one of the family's physicians. He says he uses compounding pharmacies a lot. "The value I have with specific compounding pharmacies is not only can I have things made up preservative-free, but they can make it up the way I want it made up in certain dilutions," he says. Layton treats both adults and children with issues like allergies, gastrointestinal aliments, fatigue, autism and hyperactivity. He says close to 90 percent of the prescriptions he writes must be compounded. But he's not the norm; many doctors don't even think to try something that's not mass manufactured. As for doctors who use compounding pharmacies, the FDA's Steve Silverman says they should do so with caution. "There are people who will tell you that the risks to patients are low to nonexistent. And I don't want to be alarmist," he says. "I will tell you, though, that we regularly see reports of adverse events associated with compounded drugs." Recently, there have been several instances where patients have been seriously harmed — or have even died — because of mistakes with compounded drugs. Silverman says a pharmacy in Texas made an injectable compound for neck and back pain that allegedly killed three people in the spring of 2007. He was frustrated at the pharmacist's reaction. "He was quoted as saying, 'You know what people say, stuff happens.' We view that kind of cavalier attitude — especially with respect to drugs that can kill patients if they are not prepared properly — as very troubling," Silverman says. The FDA does not regulate pharmacies; state boards of pharmacy do. 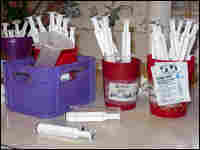 But the agency does regulate the compounds used in the mixtures. And Silverman says that the FDA supports compounding pharmacies that go through the appropriate channels but that patients should resort to compounded drugs "only in situations where FDA-approved drugs are either unavailable or, in the opinion of a health care provider, inappropriate for treatment of a specific condition." But many, like pharmacist Keach, say safety issues and abuse are rare — and that the FDA is mostly concerned with making sure that big drug companies are protected. "A lot of this is simply about power and dollars, in my opinion," he says. And he says he worries about what some patients would do if they couldn't get tailored drugs. "You know, in some cases it would definitely affect their quality of life — and in a few cases it might affect their life all together," Keach says.